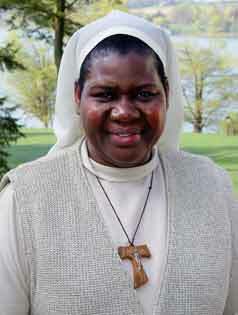 SKANEATELES, NY, May 4, 2008 -- Sister Caritas Barajingitwa, LSOSF, currently assigned to St. Mary of the Assumption Church in Binghamton, dreamed of providing a loving home and practical education for orphans in Africa. That dream came true when she opened Holy Family Vocational Orphanage in Southern Uganda in 2003. They also named her and the orphanage as the 2008 Family of the Year, dubbing her “Mama Caritas.” In conjunction with the awards, the Secular Franciscans donated $1,000 to the orphanage. The money is enough to “pay the orphanage’s bills for two months,” said Sister Caritas, a member of the African-based Little Sisters of St. Francis. With her plans to expand, and teach practical life skills, the $1,000 could also buy a brick-making machine, or eight sewing machines, she said. The orphanage houses 30 children, and includes 13 acres for farming plus 26 acres for future dormitories and a school, eventually to accommodate 100 children. Sister was honored April 25 at Stella Maris Retreat Center in Skaneateles during the annual gathering of the Secular Franciscan Order’s Blessed Kateri Tekakwitha Region (which encompasses the Albany, Syracuse, Rochester and Buffalo dioceses in New York and the Erie diocese in Pennsylvania). Sister Caritas got the idea for the orphanage while pursuing a master’s degree in education in the late 1990s at Magill University in Montreal, Quebec. In fact, the idea became her master’s thesis, she said. But God opened another door, as she would put it. The pastor of St. Mary’s in Binghamton wrote a letter to the mother superior of the Little Sisters, asking her to send one of her sisters to work in his parish. The mother superior summoned Sister Caritas and told her she was going to the United States. She arrived in June 2001. Two years later, thanks to donations by American catholics, she was able to open Holy Family Vocational Orphanage and welcome 30 children into its protection. Her fellow sisters run it. She has been returning to Uganda a couple of times a year  especially around Christmas and during the summer  when not visiting the sick and homebound in Binghamton or coordinating the parish bereavement ministry. Regional Minister Mary Frances Charsky, SFO, who made the awards presentation, noted that in September Sister Caritas plans to return to Uganda permanently. “She really wants to get to the orphanage to build on the work that has begun,” Charsky said, noting that Holy Family Vocational Orphanage Foundation, which friends set up in the U.S. to aid her cause, will continue to raise funds for sister’s dream. A proponent of teaching practical life skills as well as academics, Sister Caritas said the orphanage teaches home economics, carpentry, basket weaving, sewing and tailoring, and more recently farming and animal husbandry. And a fishery is in the offing.